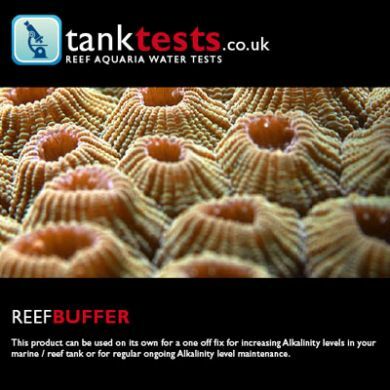 This product can be used on its own for a one off fix for increasing Alkalinity levels in your marine / reef tank or for regular ongoing Alkalinity level maintenance. 3g (two thirds of a teaspoon) will raise Alkalinity levels by approximately 1dKH in 100 litres of salt water. You should aim to maintain Alkalinity levels at around 8 to 10 dKH using a good quality reliable test kit. Simply dissolve the required amount into a litre of Reverse Osmosis Water, mix well and slowly add to your tank in an area of high flow, preferably over a period of an hour or so using a drip line or peristaltic pump. Alternatively add to your evaporation top up water and top up as normal. It is not recommended to increase Alkalinity levels by more than 1dKH per day. CAUTION: Do not add more than the stated dose, overdosing can have adverse effects on your tank water pH causing it to drop to dangerous levels.